Norbert Haug is in charge of all Mercedes-Benz motorsport activities - not just Formula 1 but also CART racing and touring cars - and he has been since October 1990 when he took over from Jochen Neerpasch, who had held the post since the start of 1989 when the German car company decided that it could publicly admit that it was actively involved in motor sport with the Sauber sportscar team. As a result of this decision the Sauber sportscars were painted silver - Mercedes-Benz's traditional racing color. The result was two World Sports-Prototype Championship titles in 1989 and 1990. Neerpasch also set up the Mercedes Junior Team drivers to get drivers Michael Schumacher, Karl Wendlinger and Heinz-Harald Frentzen into Grand Prix racing. At the time Mercedes-Benz was looking to enter F1 racing when Neerpasch decided it was a good time to leave. 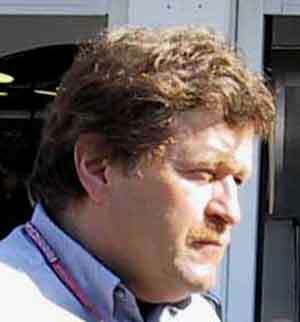 Mercedes decided that his replacement should be Haug, who had been with the company for only three months as head of the motorsport marketing department at Unterturkheim, near Stuttgart. Prior to that Haug had made a living as an automotive and motor sporting journalist. In 1985 he had risen to become editor of Germany's big-selling monthly Sport Auto, a job he held for two years before moving on to the weekly Auto Moto und Sport to be the deputy editor. His understanding of the sport and his connections within Mercedes led him to join the company. Haug ran operations at Mercedes-Benz Motorsport as the company funded a fabulous factory at Hinwil in Switzerland for Sauber and hired Harvey Postlethwaite to design a Grand Prix car. But in November 1991 the Daimler-Benz board, under extreme economic pressure, decided that it could not be directly involved and so Sauber was forced to go it alone, entering F1 in 1993 with an Ilmor-built, Sauber-badged V10 engine. Sauber's performances were promising and the Mercedes board then decided to buy into Ilmor Engineering and rebadge the engines as Mercedes V10s for 1994. At the end of that year Haug decided that in order to be successful it was necessary to be with a big team and a deal was struck with McLaren. It was not easy but in recent years Haug has had a lot to celebrate. His success led to his promotion to the position of Vice-President in charge of motorsport activities.